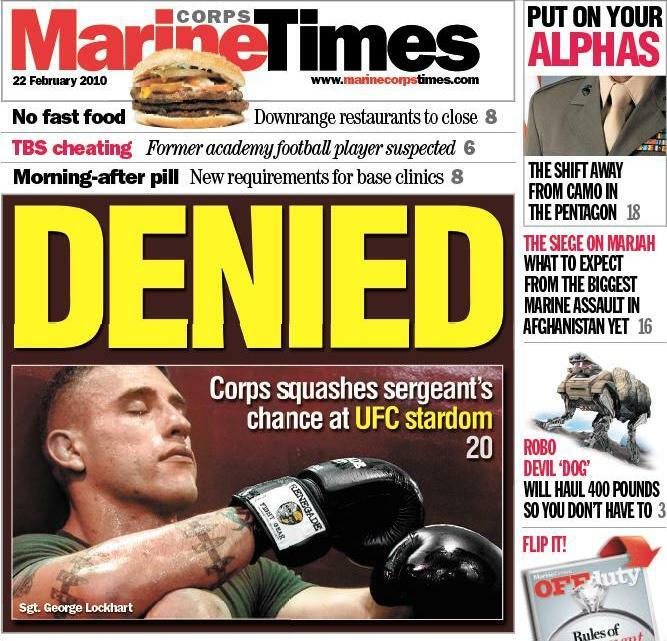 The Feb. 22, 2010, Marine Corps Times introduced Sgt. George "Loaded" Lockhart to the rest of the Marine Corps and the world. Today, our friend and fellow military blogger Phil Creed posted a great story about the re-emergence of mixed martial artist and former Marine Sgt. George “Loaded” Lockhart. Regular readers of Marine Corps Times will recognize that name. Lockhart was the subject of a cover story two years ago after the Marine Corps told him he could not accept Spike TV’s invitation to appear on “The Ultimate Fighter,” a reality show for up-and-coming MMA pros seeking a shot at UFC stardom. At the time, commanders in Quantico worried that Lockhart’s participation could reflect poorly on the institution, as some of the show’s past cast members were depicted acting immature and, well, kind of gross. That story took off online, even earning a shout out from Yahoo’s MMA blog, Cagewriter. As a Marine, Lockhart ranked among the Corps’ most skilled hand-to-hand fighters, holding the elite job of instructor trainer at the Martial Arts Center of Excellence in Quantico, Va., where he was entrusted to teach fellow practitioners of the Marine Corps Martial Arts Program how to coach and mentor others. But when the Corps denied a second invitation to appear on “The Ultimate Fighter,” Lockhart knew his days in MARPAT were numbered. He left the service last year to pursue his pro career. And so far so good. As the After Action blog points out, Lockhart won a unanimous decision Friday night in Salt Lake City, beating Jarome “Hatchet” Hatch, in his first pro fight in more than two years. His career record now stands at 11-4 and his sights are set squarely on the UFC, where his friend and fellow Marine, former Capt. Brian Stann, has won mad respect and thousands of fans. As Marine Corps Times reported on Lockhart over the past two years, we often heard from Marines wondering why the brass didn’t try to capitalize on Lockhart’s emerging celebrity status. A common argument from readers: Marine Corps Recruiting Command has a partnership with the UFC, so why not let a squared-away Marine such as Lockhart be the face of that relationship? That’s a question worth pondering, particularly in light of the sport’s immense popularity among young military-aged men and the Corps’ growing acceptance of MMA. Will a day come when an active-duty Marine, with the chops to compete in the UFC, is allowed to do so? Go figure, the Marine Corps squashes the chance for a Marine to do something awesome. And now the Corps has lost a good Marine because of it.